Auto body technicians, painters, estimators and insurers can receive a lesson in life after 150 grit with a new Society of Collision Repair Specialists video. The film, one of two released earlier this month on SCRS’ YouTube channel and announced Thursday, features DEG Administrator Danny Gredinberg’s presentation to the SCRS April 10 open board meeting. If you missed the free event in Denver, here’s your chance to catch up. 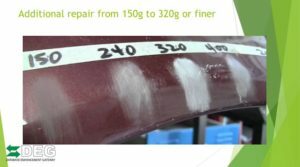 Gredinberg, a former certified luxury technician, explained that most of the estimating services’ times end at 150 grit. But at 150 grit, a part isn’t ready for paint, or even primer, according to Gredinberg. “There’s a gap,” he said. In between 150 and grits fine enough for painting lies the feather, prime and block operation, according to Gredinberg. It’s a not-included procedure in CCC and Mitchell, and the work is only included in Audatex times for replacement welded panels, he said. Failure to perform the work can lead to blemishes like sand scratches appearing as a vehicle exposed to the sun bakes and shrinks the material into the imperfections, he said. Gredinberg called feather, prime and block a refinish operation. It’s got to be done by a qualified person in an enclosed environment, he said. (Under Environmental Protection Agency Rule 6H, a painter is typically the only one allowed to apply primer.) You can’t just spray primer around on the shop floor anymore, he said. The other SCRS open meeting video announced Thursday also relates to the DEG and non-included labor operations. It features CRASH Network editor John Yoswick, who explained the “Who Pays for What?” collision repair reports his company produces in conjunction with Anderson’s Collision Advice. The quarterly “Who Pays?” surveys ask shops about their ability to collect reimbursement from the nation’s Top 8 insurers for categories of not-included operations. As not-included operations often are the subject of the inquiries the DEG passes to information providers on behalf of insurers and repairers, the partnership is logical. Going forward, the DEG will provide examples of DEG inquiries related to each procedure, CRASH Network editor John Yoswick said. See more in the video, and check out the “Who Pays?” surveys here. Make plans to attend SCRS’ next open board meeting, scheduled for 8:30-10 a.m. Aug. 7 in Room B403 of the Georgia World Congress Center in Atlanta during NACE and CIC week. The event is open to anyone interested. In other DEG news, the organization thanked Spanesi, its newest Gold sponsor and its second private-sector benefactor. Support from entities like Spanesi, PPG, SCRS, the Alliance of Automotive Service Providers and the Automotive Service Association keeps the valuable industry resource free.